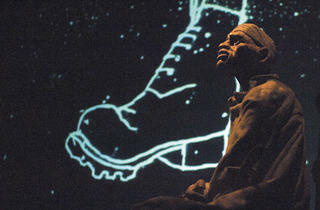 The South African puppet-theater group brings its collaboration with artist William Kentridge to the MCA. Handspring Puppet Company is best known for its extraordinary life-sized horse puppets in the National Theatre’s 2009 production of War Horse, which went on to a record-breaking run in the West End, a Broadway production and a U.S. national tour. But before War Horse trots into the Cadillac Palace in December, the MCA will present Woyzeck on the Highveld, a more explicitly political production set in Handspring’s native South Africa. The show transplants Georg Büchner’s Woyzeck—a fragmented, proto-expressionistic tragedy about a working-class soldier driven to murder by unrelenting social coercions—from 19th-century Germany to post-apartheid Johannesburg. 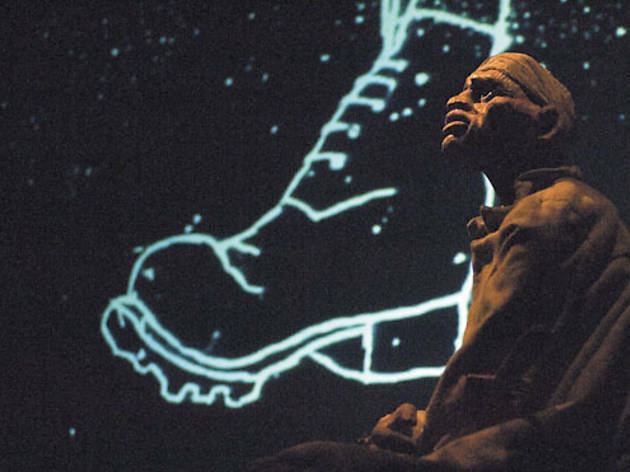 Woyzeck on the Highveld combines puppetry with live acting, music and animations by iconic South African visual artist William Kentridge, a frequent Handspring collaborator whose work articulates living history in his homeland. Upstairs at the MCA, a collection of Kentridge’s drawings used to make two of his films is on display through March 13 as part of the MCA DNA series. For his animations, Kentridge photographs successive drawings created by adding layer upon layer of charcoal and ink to the same piece of paper—a metaphor for the blotting out and rewriting of history and memory. In Woyzeck on the Highveld, you move the action in time and place, and you change the main character from a soldier to a migrant worker. What inspired you to adapt this fragmented, unfinished play to explore apartheid? Originally, William wanted to make a play based on the life of a man who lived on the street in one of Johannesburg’s blue-collar suburbs. We knew of Woyzeck and were using the text as inspiration. However, the more we studied it, the more we realized that this text spoke very directly to our situation in the last days of apartheid South Africa and that we couldn’t improve on it.… The apparently cut-up nature of Woyzeck’s text automatically makes it more filmic, more exciting and more contemporary. In Woyzeck the soldier often seems puppet-like; he’s acted upon more than he acts, until he’s pushed into murder. Do you find that in combining artistic genres like animation and puppetry, you’re able to draw out these sorts of themes? I think the underlying question here is: “Why puppets?” or “What’s the offer that puppets make to the theater in general and this play in particular?” And it’s a question I couldn’t have answered 20 years ago, when we first started this production. With hindsight, I can say that one of the things that puppets do well that humans beings don’t is they exemplify the everyday struggle to live that we all experience privately. The puppeteer has to struggle to keep them alive every moment they are onstage. If the puppeteer’s attention to this task fails, the puppet immediately “dies.” The puppeteers’ effort in mastering their mechanisms and willing them into living, emotionally charged beings becomes a kind of triumph. You’ve worked with Kentridge for years. Why do you think his animations are so consistently powerful for audiences? When Woyzeck sits looking out towards the audience in front of one of Kentridge’s roiling landscapes, we are drawn right inside the mind of this wooden puppet. When we started working with William and I saw this phenomenon for the first time, I knew we had a huge adventure ahead of us: the exploration of the mind of the thinking puppet. So it has proved to be. Woyzeck on the Highveld runs Thursday 27 through Sunday 30 at the MCA.